The property is connected to both mains water and electricity and benefits from a large well. On the ground floor, coming into the entrance den, there is a living room or study with a wood burner and a bedroom and a bathroom to the left, and to the right there is a staircase to the first floor, a second living room with fireplace, and a country style kitchen. The rooms have exposed wooden ceilings and terracotta floors. The chimney of the fireplace in this living room is built within the staircase to the first floor and hereby serves as heating. The living room has two double doors which open to a covered porch with stone laid floor. A wooden staircase leads up to the first floor, where there is a bedroom and a bathroom and a veranda with good views. Many traditional aspects of the old stone house have been retained, such as the style of the windows, the wooden ceilings and some exposed stones in the walls. A ground floor with two large rooms and one smaller, all with good standing height and dry. The ground floor could be converted into a kitchen and living room area, with access to the terrace in front of the house. An external stone staircase leads up to the entrance door of the top floor. The door opens onto a corridor, from which there are two very large and light flooded rooms with parquet floors, and a bathroom at the end. This second house would make a fabulous guest house. It is in good order of repair, but does need some maintenance works carried out. There is also a large garage and storage building on the plot, which could be converted into another self-sufficient annex. The plot measures about 1.500 square meters and is large enough to have a swimming pool installed and there are quite a number of mature fruit and olive trees, as well as decorative plants and flowers. The main plot is fenced. Included In this sale, there is yet another plot of land outside of the fenced plot, which measures about 1.000 square meters and is flat. There are a good number of mature olive trees on this plot, which would also serve nicely as a vegetable garden. 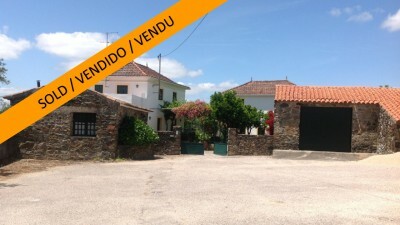 The property is located two km from the village of Fundada, in a very quiet location and is not overlooked. In Fundade, there are basic amenities like mini-markets, health center extension, cash machine, social center and café, and a church. The larger town of Vila de Rei is a ten minute drive away. Vila de Rei has a variety of supermarkets, shops, cafes, restaurants, schools, health centers, sports centers, museums, pharmacies, banks, post office and parks. The property is also 15 minutes by car to the town of Sertã with all the facilities of a larger town, including weekly markets. The river beach of Fernandaires, which has a cafe bar and water sports available, is only eight km or a few minutes by car. The popular water sports “Centro Naútico do Zêzere” at Trízio, the Portuguese wake board center, is only 12 km away. The dual carrier way A23 is a 20 minute drive from the property. The closest airport to the property is situated at Lisbon, which is around one and a half hours by car.